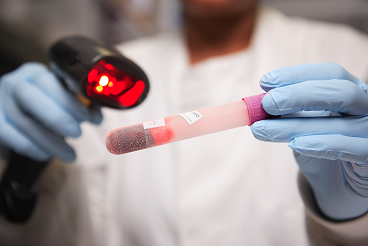 Barts ECMC is a centre of excellence that will facilitate the translation of basic scientific discovery into the delivery of novel treatments to patients with cancer. It had extended both scopes of the existing Barts Centre, by encompassing new therapeutic approaches and tumour types, and the number of patients with cancer to whom innovative trials can be offered to over 9,000 a year. Professor Peter Schmid was appointed as Chair in Cancer Medicine at Barts Cancer Institute in 2013, and is the Lead of their ECMC. Schmid’s specialist cancer interests are breast cancer, cancer immune therapy and early drug development. His group focuses on validating new therapeutic targets exploiting synthetic sensitivity interactions based on specific genetic or epigenetic cellular backgrounds. Professor Schmid has successfully led more than 20 national/international academic clinical studies, ranging from phase I to III, and several translational research programmes. As lead of the Centre of Experimental Cancer Medicine, he manages a team of >80 staff members to deliver the expanding clinical research portfolio at Barts Health NHS Trust and Barts Cancer Institute. Professor Nick Lemoine was Professor of Molecular Pathology at Imperial College London, where he was Director of the Cancer Research UK Molecular Oncology Unit and the first Director of the National Translational Cancer Research Centre at Hammersmith Hospital. Before that, Nick held academic positions at the Royal Postgraduate Medical School, London and The University of Wales College of Medicine in Cardiff. He trained in medicine at St Bartholomew's Hospital Medical College where he qualified with the University of London Gold Medal in 1983, specialising in pathology and oncology with posts in London and Cardiff. Nick recently stepped down as Chairman of the MRC Clinical Research & Career Development Panel and the National Institute of Health Research Clinician Scientist Appointments & Review Panel. He previously chaired the MRC Stem Cell Fellowship Panel, the CR-UK Clinician Scientist and Senior Clinician Fellowship Panel and the MRC Experimental Medicine Review Panel for the Molecular & Cellular Medicine Board. Nick has been a long-serving member of the Gene Therapy Advisory Committee at the Department of Health, as well as CR-UK Science Funding Committee, MRC Molecular & Cellular Medicine Board, CORE Scientific Advisory Board and many other scientific review committees. He has been the Editor of the Nature Specialist Journal Gene Therapy since 1997, and his research into the molecular genetics of cancer and gene therapy is funded by programme grants from Cancer Research UK, Digestive Cancer Campaign and the European Union. Nick was elected a fellow of the Academy of Medical Sciences in 2006. The results of a groundbreaking ECMC clinical trial lead by Professor Thomas Powles at the Barts Cancer Institute has major significance in finding new treatment for metastatic urothelial bladder cancer (UBC). The phase I trial tested the effectiveness of the drug MPDL3280A (produced by Roche) in patients with advanced bladder cancer. The trial had an adaptative design which allows researchers to assess the frequency and relevance of biomarkers as well as the efficacy in specific tumour types. Of the 68 patients with UBC who were given the drug, more than half showed signs of effectiveness whilst toxicity remained low. The positive response among patients to this drug has had a significant impact in the field of immunotherapy. MPDL3280A is an antibody that targets programmed death-ligand 1 (PD-L1), a protein used by cancer cells to hide from immune surveillance. The binding of this drug to PD-L1 exposes cancer cells to the immune system, which facilitates their destruction. Prof. Powles emphasised the importance of his findings to clinical practice. 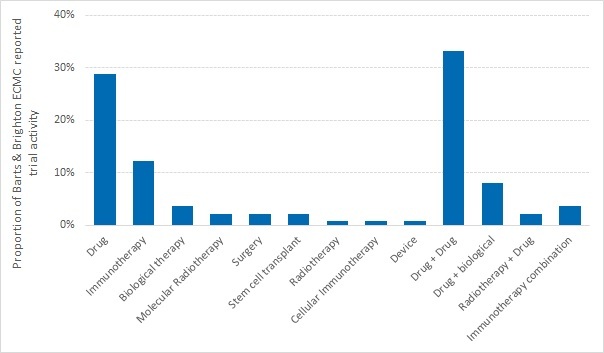 No major advances have occurred in UBC for the last 30 years and chemotherapy, the main treatment option, is poorly tolerated by the majority of patients. 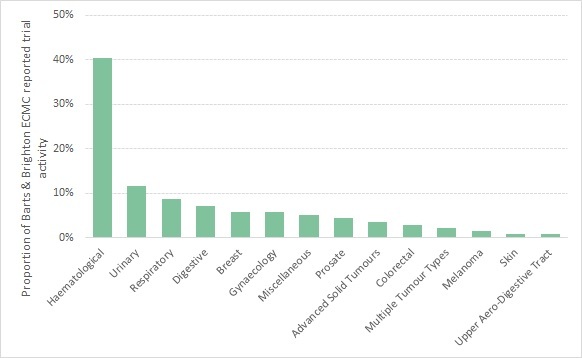 As a result, outcomes for patients with advanced bladder cancer (the seventh most common form of cancer in the UK) remains poor. Thus, the promising outcomes from this ECMC trial granted MPDL3280A a breakthrough designation status by the US Food and Drug Administration (FDA) in June 2014. Find the paper, published in Nature, here. PD/PK and biomarkers, imaging, gene therapy, immunotherapy, pharmacogenomics and pharmacogenetics in vitro collerates of response. 45 beds for medical oncology and clinics including 16 single rooms (three of which are radiation-protected), staffed by 28 nurses and 9 HCSW; staffed by 26 nurses and 9.2 HCSW. A 15 bedded hostel on site has recently opened to allow patients to be treated in an outpatient setting. Cytotoxic reconstitution pharmacy suite with three Chemical Dispensing Cabinets; the facility is licensed by the MHRA. Cancer Research UK, Lincoln's Inn Fields, London WC2A 3PX - available through ongoing collaborations with investigators at Cancer Research UK London Research Institute. ECMC funding provides infrastructure support for early phase and translational research. From the ECMC Barts portfolio, the following trials have been carried out.